The apron is the corner of an antique handkerchief and the duster is a golf tee with shredded silk for feathers. More of this please! 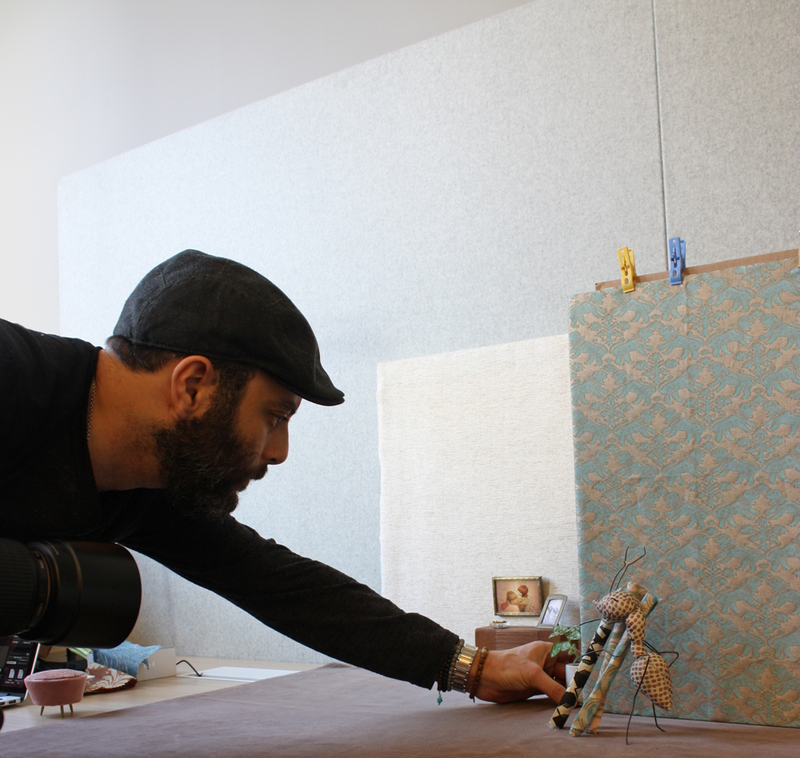 I so enjoyed making it and always love collaborating with the super creative Fortuny team – creative director – Mickey Riad photographed the little scenes beautifully. 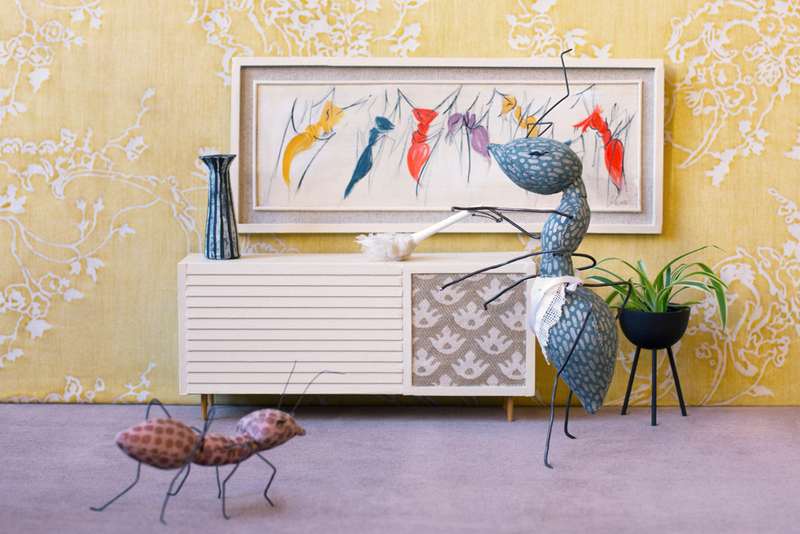 You can find the ants in the Interior Design Fall Market issue. 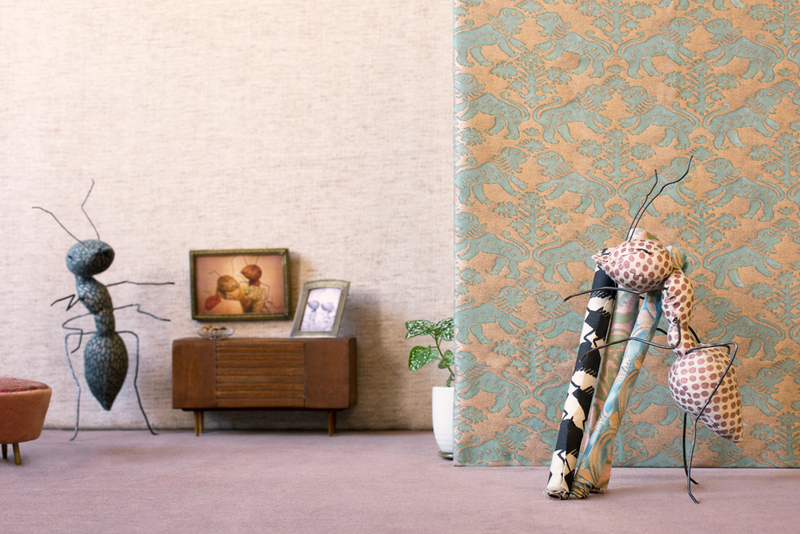 And, if you happen to be in Manhattan, on the 16th floor of the D&D building – in Fortuny’s holiday window. Oh my! This is breathtaking. Well done!! Ann, this is super fantastic and so inspiring! Well done, I say, well done! I read ancestors as “ant-cestors”. I really love your ant art pieces, especially the painting in the first image. I can tell how much research went into it. I felt like I had seen it somewhere before, and at the same time, I knew it was an original piece. Reading about and viewing your creativity is a sparkling time of my day… I am in awe of your needle and cloth and paper adventures.. and while I am way too old (90) to imagine augmenting my own creativity.. and the time/energy required.. this blog does inspire me to take up my own needle and small scrappy quilted projects. Absolutely wonderful, Ann… well done down to the tiniest, last detail! That is stunning! You are amazing in both talent and imagination! That is just lovely. So imaginative. It looks and sounds like you had such fun creating. What a stunning concept and execution. Fantastical! I love the miniature realities you create. Oh, Ann. I think you have outdone yourself this time. 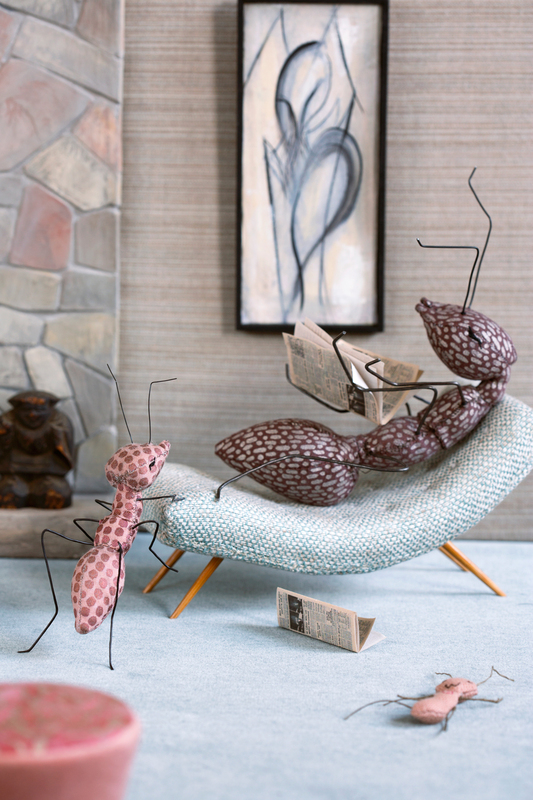 Seriously, is there anything more sublime than combining miniatures with mid-century modern? No, there is not. Just absolutely wonderful and inspiring. Thanks for sharing this magical, tiny (and hip) world with us! How Cosmopolitan… Nothing but the best will do for these so well-appointed creatures. Can you see any childr-ants in their future? Hi Carolyn – Thanks so much – cosmopolitan -THATS the word I was looking for! These are sooo cute! I wish I could see the Fortuny window – but I’m a country gal and avoid the big city, lol. I did tell a friend about it, since she may be visiting her brother there this season. 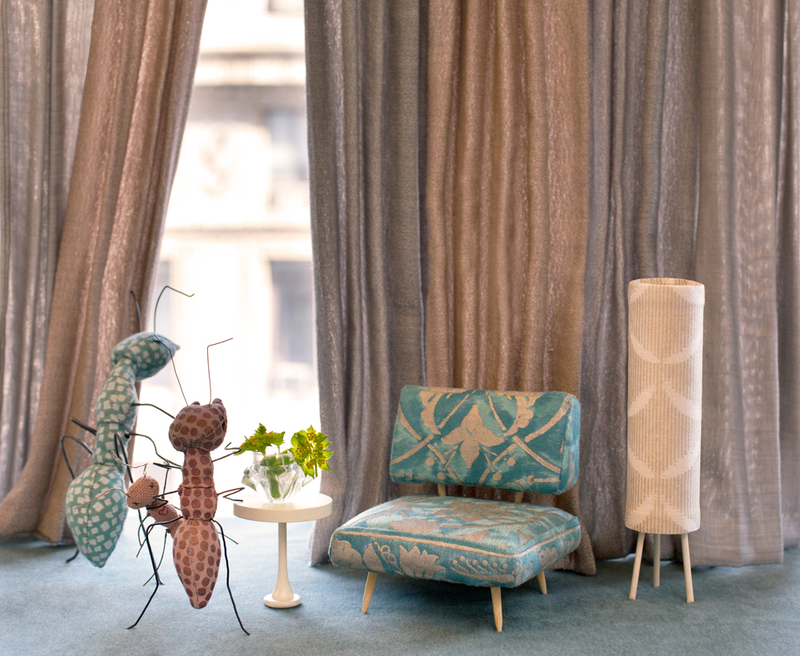 I love this year’s fabrics, and the poses of the ants are just fun! 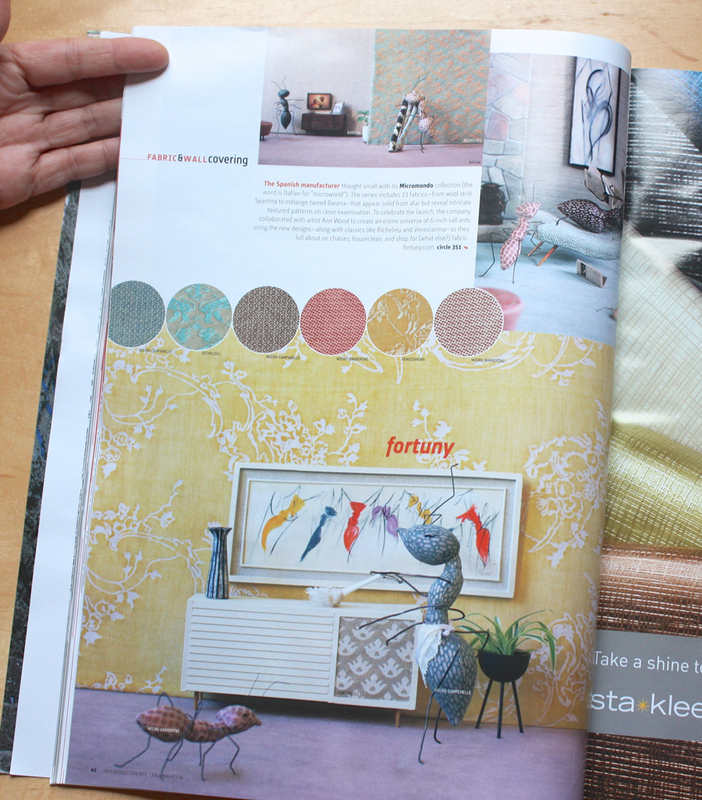 And the furnishings – wow! Cosmopolitants!!! Love these! You are so creative-thanks for sharing. Will this be a future pattern? Brilliant! Love that they have antcestors. 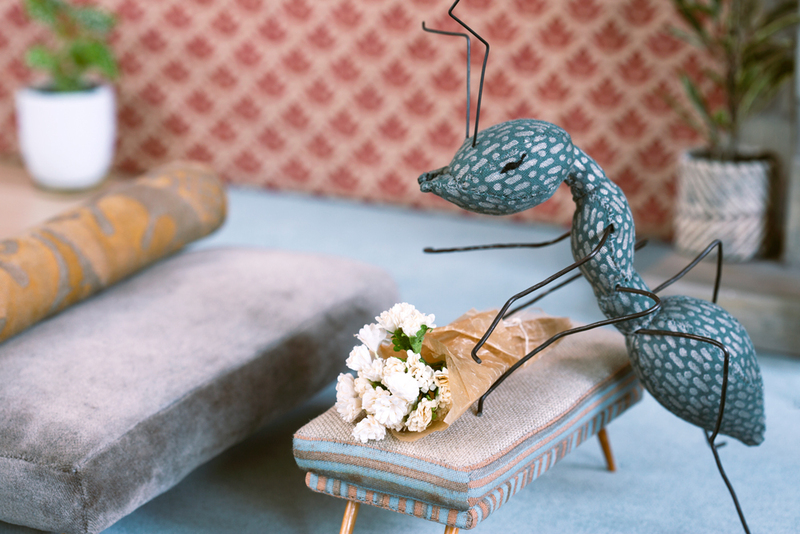 I love that you gave the wee ant a dolly :-). How wonderful! Although I’m always fighting the ant colony at home, they really are interesting and industrious creatures. 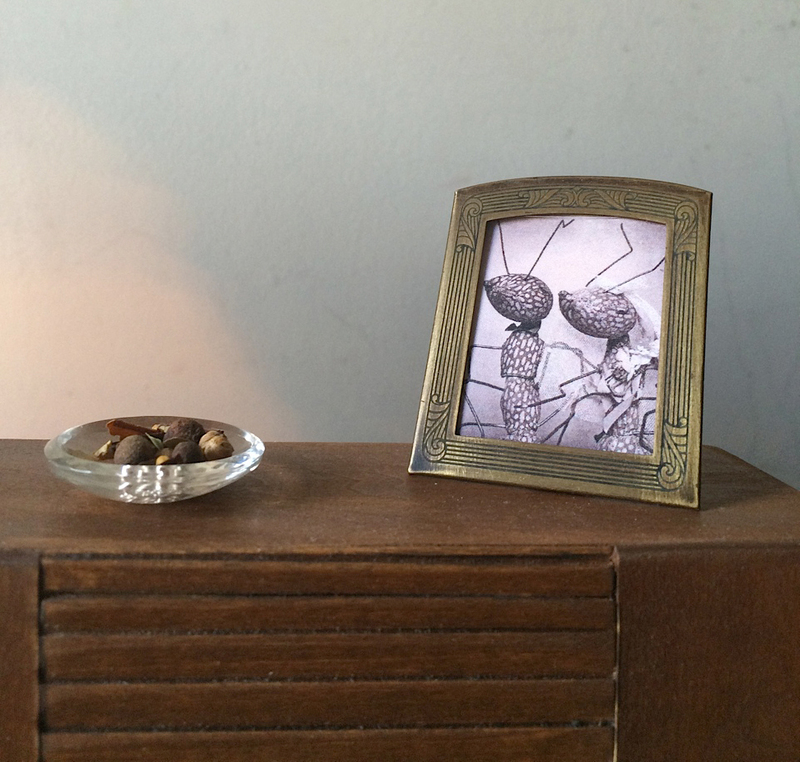 I love your little ants as well as your mosquitoes. You’ve really captured them and made them appealing! Keep your creative juices flowing–we all love and appreciate the time and sharing you give to all your loyal followers. Ridiculously fantastic!!! Love all of this Ann. The art and antcestors are brilliant! Congrats. What a fun job! I am fascinated with all the details and I keep looking back at the photos to see what I missed before. What a fabulous collection, the amazing set up and photography. I love your creativity. Previous Postmr. socks : a new sewing pattern!